HomeHearings LossDo Hearing Aids contribute in Hearing Loss progression? This is one of the most common questions raised by those who just started using hearing aids, Do Hearing Aids contribute in Hearing Loss progression? The short and simple answer to this question is “NO”. The answer will be so as long as your hearing aid is properly programmed according to your specific hearing loss. However, hearing aids actually keep your hearing abilities intact, while delaying the progression of hearing loss over time. This follows a famous saying, “Use it, or lose it”. If hearing aids do not contribute to hearing loss progression, then why does this question is raised so often? After a few weeks of using hearing aids, some people get concerned that they are not able to hear as well without their aids as they could hear before they started wearing hearing aids. Whereas in reality, it is a misconception which occurs because their brain is tricking them. And all this is a matter of perception. But there is always another side of the story, where it all depends on the degree of hearing loss. On average, a person with hearing loss at least waits seven to ten years before seeking help from a hearing healthcare professional (1800-121-4408). It’s most likely to experience progression in hearing impairment throughout that period of time. As a result, the brain gets customary to hearing impairment and begins to perceive that level of hearing ability as “normal.” The brain gets used to hearing fewer sounds. Therefore, straining to discern conversations. As soon as you begin using hearing aids, the brain will receive information it has not gotten in some time and becomes the new normal for you. The volume and striking clarity of sounds can be a little unpleasant for the starting few weeks. All this happens as your brain is trying to adjust and learn to recognize altogether new “normal” level of hearing ability. As soon as you get habitual to your hearing aid, your hearing loss becomes more noticeable when you aren’t wearing hearing devices. It must be noticed that without your aid, sounds around you seem drastically muted and hearing disability appears worse. Reason: because they are!!! It’s just that you notice it more as you have been experiencing better hearing with the help of hearing aids. The process is similar to the eyes’ ability to adjust according to the intensity of light. If you’ve been in a dark room for a while, you may see some shapes or even some shades of color. The moment the lights are turned on, it seems too bright. This is so because your eyes require time to adjust to the sudden change. Once they get adjusted, everything appears to be much clear and full of life. As the lights are turned off, those shapes and shades of colors are not visible anymore. Did you experience any progression in vision loss suddenly due to the exposure to light? NO, but now it’s clear about how limited was the visibility to your eyes in the dark. There are some people who express their concerns that hearing aids may be dangerous for their eardrums. However, it is not the case with the fit and correctly programmed devices. Proper programming of hearing aids is critical, as hearing loss is often due to prolonged exposure to loud noise(80db is the threshold). Hearing aids amplify and process the sounds so it becomes more easy for us to hear it. It’s a fact that powerful sounds i.e. loud music through headphones played directly next to your eardrum can damage your ears as well as hearing ability. However, for those with hearing loss, the volume of well-fit hearing aids won’t harm their eardrums. If your hearing aids are fitted and programmed by an experienced hearing healthcare professional, it will be done to fit your custom level of hearing loss. Therefore, the level of amplification and sound processing will be done accordingly to allow you to hear as naturally as possible. If your hearing aids seem too loud, even after the rehabilitation period, then go back to your hearing professional to get them readjusted. It could be dangerous to use the device programmed to amplify frequencies you can already hear well. If the hearing device of children with hearing loss is too loud, then they may not know enough to speak up for themselves. For this, keep a close eye on the way children interact with hearing devices so as to be sure if they need reprogramming or not. There are situations when improperly-fit hearing aids can be dangerous to hearing ability. If they’re programmed to be louder than required for a specific hearing loss, then there can be noise damage due to the sound levels. It is often in hearing aids bought online. Online retailers make adjustments based on that information you send in the form of your audiogram results. Though it is a great alternative to experienced professional programming in person can’t be substituted. It’s a point to remember that personal sound amplifiers (PSAPs found in drug stores or magazine advertisement) are not meant to help with hearing loss. They are no substitute for hearing aids. Rather they are meant to help people with normal hearing hear very quiet noises better (i.e. a hunter listening for a deer). As compared to hearing aids these devices may pose a danger to your hearing as they are being too loud for your needs. Hearing aids, along with being safe can also life-changing. Take your step towards being engaged in the hearing world by finding a trusted and experienced hearing healthcare provider. Do Hearing Aids Slow or Stop Hearing Loss Progression? As we discussed above the famous saying, “use it or lose it”. Typically, the phrase is used to refer to muscle atrophy. But in some cases, it applies to hear as well. In order to remain healthy, nerves need regular stimulation. If you are experiencing hearing loss, some of the auditory nerve cells are not being used often, so they can get weaken further. Plus, the brain works harder to hear sounds. This is due to less incoming information through the damaged or weakened nerves. The combination of these two will lead to a further hearing loss. Meanwhile, hearing aids amplify sounds you would struggle to hear otherwise, stimulating the auditory nerve cells and letting them “exercising”, so your hearing stays optimal under the conditions. This lets you maintain the quality of your life. Is Purchasing them an option? The longer you live with your hearing loss and without hearing aids, the less “exercise” your auditory nerves get. This lets your hearing loss become worse. However, you may go for another option based on cost. Custom hearing aids are an expensive option. There are some Hearing Aid companies which offers a selection of affordable hearing aids. These can help you improve your quality of life and slow the progression of hearing loss. You can acquire the latest hearing aids at a fair price through Hearing Sol. To know more such information, browse our website. Or if you need any help with Hearing Aid Devices. 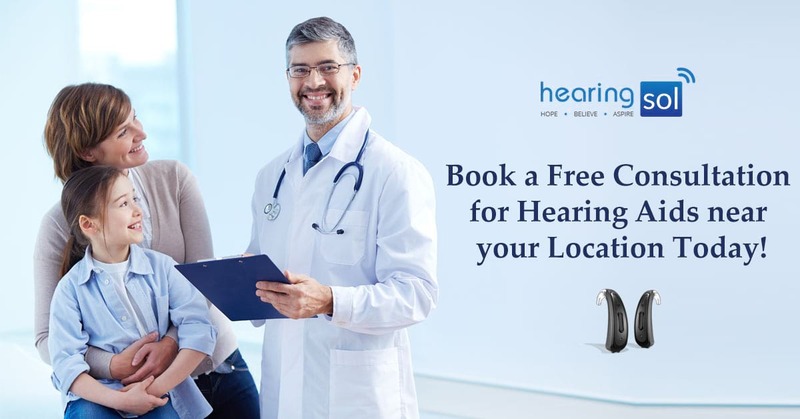 Feel free to call us on our toll-free 1800-121-4408, or can also book an appointment for a FREE consultation for hearing aids at HearingSol clinic.